I’ve been drinking quite a lot of the old ESB recently – partly because it’s on special offer – but it’s such a lovely beer I’d also be happy to buy it when priced normally! Pours like a statesman into the nobel glass – beautiful dark orange amber in colour – as clean and as clear as is possible. There is barely any head when pouring and within seconds nothing. The taste is really sweet, malty, and deeply fruity – warm alcohol with a medium bitter hoppy finish – which reminds me it’s a great beer. There is some pleasant refreshing carbonation – offering tiny little fizzy bubbles. ESB was launched into the Fuller’s family in 1971, as a winter brew to replace a beer named Old Burton Extra. The potential of the beer was soon realised and ESB was installed as a permanent fixture, creating an immediate impact. Not only was it one of the strongest regularly brewed draught beers in the country (at 5.5% ABV), it was also one of the tastiest, and as the awareness of the beer grew, so did its popularity. ESB’s reputation was soon enhanced after being named CAMRA’s (Campaign for Real Ale) Beer of the Year in 1978, and the beer has not stopped winning since! 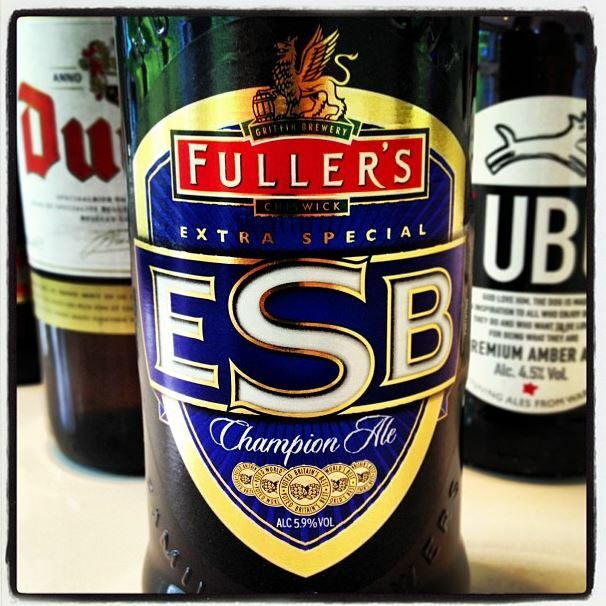 With three CAMRA Beer of the Year awards, two World Champion Beer awards, and numerous other gold medals to speak of, ESB is, quite simply, the Champion Ale. Brewed at 5.5% ABV in cask and 5.9% ABV in bottle, ESB is a true liquid legend, and should be savoured as such. If you are familiar with this beer, you will undoubtedly be aware of the unique glass that ESB is presented in. This glass was specially selected to help enhance the experience of drinking ESB, so why not visit the online store and purchase a glass to enjoy ESB the way it is meant to be served? ESB has a wonderful rich mahogany appearance. Taking in the nose, the beer is bursting with cherry and orange, balanced by soft malty toffee and caramel notes. The flavour delivers everything you would expect from such a full-bodied ale. The unique blend of Northdown, Target, Challenger and Goldings hops imparts grassy, peppery notes on the tongue along with intense citrus fruit characters of grapefruits, oranges and lemons. The blend of Pale Ale and Crystal malts in the brew give a biscuity, toffee element to the beer. A smooth, mellow bitterness lingers on the palate to give a superbly satisfying finish.